The spotlight head angles can be easily adjusted. Includes 3 x 9W GU10 Spotlight Bulbs (50W Equivalent). Shiny Black Gloss Finish. Bulb Life: 8,000 hours (Approx). A Energy Rated Bulbs. 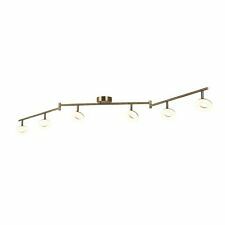 Add this stylish and functional 4 light spot split bar to your kitchen or living room for a generous spread of illumination. Control the direction of light with this 4 square spot split-bar in satin silver. Using a modifiable split bar, square design and satin silver finish provides a contemporary yet timeless style. LEDs use up to 85% less energy and last up to 20 times longer than incandescent bulbs. Mars 4 light IP44 bathroom Chrome bar supplied complete with frosted glasses, Arms can be adjusted to throw the light where you require it. Featuring an antique brass design this fully adjustable split-bar fitting will certainly turn heads. Using 4 lights and a frosted glass effect allows for a gentle warming spread of illumination. Attach this fully directional item to the ceiling of your bathroom. This item has a rating of IP44, meaning that it is fully splash proof and suitable for use in a bathroom setting. This visually striking spotlight split bar will act as a centrepiece to any modern setting. The 6 spotlights provide a bold projection of illumination and sit on an adjustable split bar. The large item is perfect for adding a contemporary appeal to kitchens, dining rooms and living rooms. View as a set of further items from the stunning Diablo collection. LEDs use up to 85% less energy and last up to 20 times longer than incandescent bulbs. Searchlight 5 Lights LED Cable Kit Adjustable Spotlights Chrome Ceiling Light. Create a directional source of warm glow to brighten your home with this square head spot plate. The stylish design features 3 sleek square head lights that are attached to a circular chrome base. A chrome finish gives a modern feeling that is complimented by the frosted light. LEDs use up to 85% less energy and last up to 20 times longer than incandescent bulbs. Add a stylish feel to your home using this attractive chrome split bar feature. Encompassing 4 square head lights allows for a an even spread of light to be distributed. The design of this item feels very modern and it is the perfect addition for any contemporary living area. LEDs use up to 85% less energy and last up to 20 times longer than incandescent bulbs. Place this sleek 3 light spotlight plate on the ceiling of any fashionable home. The antique silver design suits a range of traditional or contemporary decors. The direction of the 3 lights can be altered for convenience. IP44 rated making it fully splashproof and suitable for bathroom use in zones 1 and 2. Length - 715mm. Height - 170mm. Top Hat frosted glass and clear flush fitting, with satin silver finish spot heads. Fully adjustable. Provide instant style to a traditional home with this beautiful 3 light feature in antique brass. The directional donut shaped lights are attached to a round plate that will attach to your ceiling. Antique brass provides a classic look which is modernised with the donut spotlights. LEDs use up to 85% less energy and last up to 20 times longer than incandescent bulbs. Suspending from a slender bar, this feature will shower your kitchen or living room with four bold directional beams of light. This industrial inspired fitting is both stylish and modern. View as a set with further items from the Focus collection. It would make a striking addition to any modern or contemporary space. Length - 5000mm. Product code: 1744-LED. Provide a contemporary feel to your home with this simple yet stylish 4 light head split in white and chrome. The cylindrical lights are attached to a 2 part slim white bar that can be rotated to suit your preference. A spread of light will warmly brighten your living room, kitchen or any room of your choice. Illuminate your home using this impressive 6 light donut split-bar. The item is formed using 3 chrome parts which can be adjusted to suit your preference. Donut shaped lights will provide wonderfully warm directional sources of brightness, ideal for kitchens or dining rooms. LEDs use up to 85% less energy and last up to 20 times longer than incandescent bulbs. Top Hat halogen 5-light bar fitting. Frosted/clear glass plate mounted on brushed nickel back plate. Complete with satin silver finish spotlights. Fully adjustable. This Rollo White 3 light spot plate features a modern white circular baseplate with adjustable cylindrical spot heads each of which house an integral LED light source. To view the full range just type Rollo into the search box. To view the full range just type Rollo into the search box. Paper Lantern Shades. Bathroom Lighting. Kid's Lighting. LED Lighting. Light Colour: 3000K (Warm White). Outdoor Lighting. Tiffany Wall Lights. Searchlight Diablo 6 Lights LED Matt Black/Gold Split Bar Ceiling Spotbar Light. Searchlight Diablo 3 Light LED Matt Black/Gold Adjustable Head Ceiling Spotlight. BUBBLES LED 3 LIGHT ROUND SPOT IN CHROME WITH BUBBLE EFFECT ACRYLIC SHADES. IP44 SUITABLE FOR BATHROOMS. Product Info: When lit, this attractive cable kit provides a beautiful spread of radiant glow, perfect for kitchens or dining rooms. Class three. INDOOR LIGHTING. Bulb Details MR16 LED. BATHROOM LIGHTING. To view the full range just type Diablo into the search box. Paper Lantern Shades. Bathroom Lighting. LED Lighting. Kid's Lighting. Modern Ceiling Lights. Outdoor Lighting. Light Colour: 3000K (Warm White). This Modern Single LED Wall Light from the 'Decco' range by Searchlight Lighting looks great and is ideal wherever a modern look is desired. The 'Decco' range consists of matching 4 and 3 Light Spotlight. The four spotlight heads compriseadjustable circles each lined with an integral LED light source using the latest energy saving LED technology. To view the full range just type Donut into the search box. This fashionable 3 light head spot plate provides a warm directional source of light. The beams of light are attached by chrome to a smooth white base. Use to compliment modern decor in a kitchen or dining room. Spot bar white/chrome 6 light egg split. 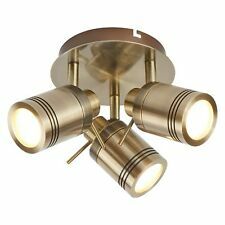 Searchlight Donut 6 Lights LED Antique Brass Split Bar Spotlight Ceiling Spotbar. SEARCHLIGHT - ARIES IP44 4 LIGHT ADJUSTABLE BAR SPOTLIGHT. The ceiling spotlight is IP44 rated and fully splashproof. Colour Temperature 3000K (Warm White). Lamp Type Gu10 Led Ip44. Lamp Type 2. Lamp Included Yes. 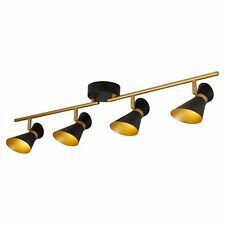 Searchlight Samson 6 Lights Antique Brass Split Bar Bathroom Ceiling Spotlight. The six spotlight heads comprise adjustable circles each lined with an integral LED light source using the latest energy saving LED technology. To view the full range just type Donut into the search box. 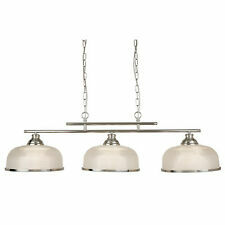 This charming 3 light item forms part of the wonderful BISTRO II collection. With a halothane glass effect, the lighting fitting is textured which compliments the antique brass trim. The solid chain provides a slight industrial feel to the otherwise traditional item. MESH SPOT II 4 LIGHT SPLIT BAR SPOT - CHROME LOOP SHADE- CLEAR GLASS BEADS. Aries flush chrome/satin silver finish halogen spotlight. Adjustable. suitable for bathrooms. IP44. 3 LIGHT CHROME FLUSH SPOT WITH FROSTED GLASS SHADES WITH CLEAR BAND. IP44 RATED FOR BATHROOM USE CATEGORY: BATHROOM. Searchlight Bistro II 2 Lights Antique Brass Halophane Glass Ceiling Bar Light. BUBBLES LED 4 LIGHT BAR SPOT IN CHROME WITH BUBBLE EFFECT ACRYLIC SHADE. IP44 SUITABLE FOR BATHROOMS. Suspending from a solid and sturdy ceiling bar, the chunky satin silver chain reaches 2 bars before reaching the lights. From the bistro collection, this 2 light item exudes sophistication and is perfect for a classic home setting. The ribbed halophane glass is complimented by a satin silver trim. This simple but stylish 3 light spot plate is perfect for providing a spread of directional illumination. Satin silver and square heads lend a feeling of style for any modern home setting. View as a set with item 4231SS - 1LT LED Square Head Spot Wall Bracket, Satin Silver. LEDs use up to 85% less energy and last up to 20 times longer than incandescent bulbs. 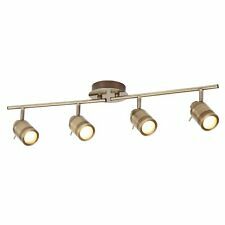 A really popular light manufactured by Searchlight from its Aries Range, we've sold 100's of this fitting over the counter and online. Bulb fitting: Halogen GU10 x 1 35W - Bulbs are included free with this item. Create a feeling of sophistication using this 2 light spotlight bar feature. The contrast in colours between the matt black and lustrous gold is stylish and glamorous; ideal for complimenting any contemporary home setting. View as a set of further items from the stunning Diablo collection. LEDs use up to 85% less energy and last up to 20 times longer than incandescent bulbs.